The anatomy of the ear is precisely shaped to capture sound waves and amplify them. When sound waves enter the ear, they follow what might seem like a long and arduous path. But every structure has a precise function. Sound waves are picked up by the outer ear, which is made up of the pinna and the ear canal. Sound is channeled to the eardrum, which vibrates when the sound waves touch it. 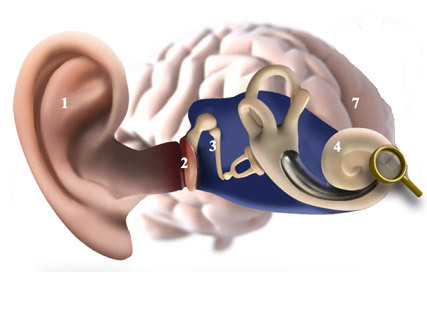 The vibrations are picked up by three tiny bones known as the malleus (hammer), incus (anvil), and stapes (stirrup), which create a bridge from the eardrum to the inner ear. The vibrations move on to the cochlea – a spiral-shaped capsule housing a system of liquid-filled tubes that are lined with thousands of tiny hair cells. When the sound waves reach the liquid it begins to move, setting the hair cells in motion. The movements of the hair cells are transformed into electrical impulses that travel along the auditory nerve to the brain. The brain decodes and interprets the electrical impulses, turning a stream of speech sounds into separate, recognizable words.